Summer might be over but it doesn’t mean salad season ends! Farmer’s markets are still full of produce making it the perfect time to play around with salad recipes. There are so many vegetables and it’s fun to play around with combinations, dressings and flavors. This particular recipe might not be the healthiest of salad options because of the irresistible bacon vinaigrette but it’s worth the extra calories. Leave the chicken out to make this an appetizer and keep it in for a hearty dinner salad. Baby greens are an easy option to work with when it comes to salads. A pre-packaged bag or box of baby greens (or spring greens), is a combination of baby spinach, baby kale, baby red leaf and arugula. Because they’re “baby” versions, they tend to have a milder flavor which make them nice to work with when considering the flavor profile. Today’s recipe is one of my favorite salad recipes I’ve come up with. Blame it on the bacon! Once you crisp the bacon, this recipe is easy to whip up. Whisk the vinaigrette (which is fantastic, by the way), throw the salad together and you’re set! I like to pick up Rotisserie chicken or the pre-cooked chicken you find in the deli section. Goat cheese crumbles are pretty easy to find but a log of goat cheese will work just as well. Use a fork to crumble it into pieces while it’s cold over the top of the salad. The warm vinaigrette melts it enough so the salad becomes almost creamy. 1 - Prep the salad. Mix together the baby greens, tomatoes, cucumber and chicken. 2 - Prep the vinaigrette. In a large pan, cook bacon until crisp. Transfer to a plate lined with paper towels to drain the grease. Pour out all but about a tsp of the bacon grease. Return to a medium heat and add the shallots. Cook 1-2 minutes until translucent. Add the garlic and cook about a minute until fragrant. Add the vinegar and let boil for about 30 seconds. 3 - Pour into a heat proof bowl or jar. Whisk in mustard until emulsified. Whisk in maple syrup. Once combined, slowly whisk in the olive oil until well combined. 4 - Chop up the bacon. 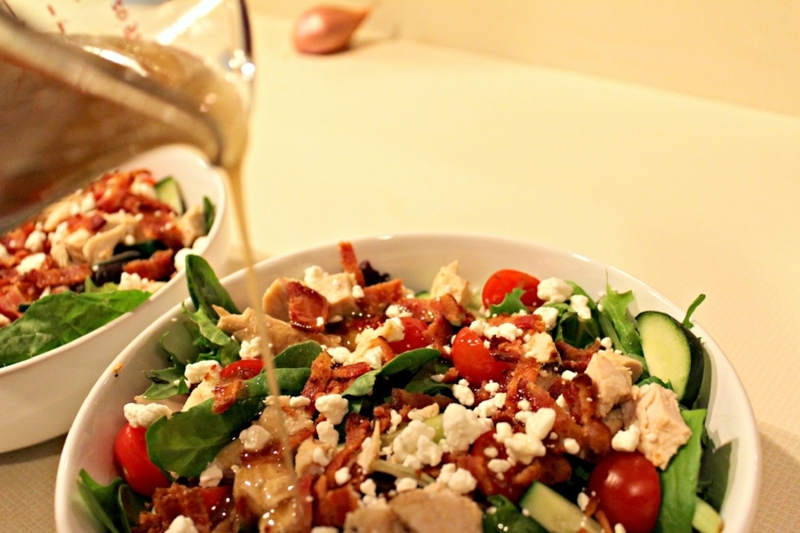 Top the salad with goat cheese, bacon and drizzle with vinaigrette. Serve.